The collapsible water canteen is intended for use in temperate and tropical environments for carrying drinking water. The canteen is intended primarily for use in temperate and tropical environments for carrying drinking water. The M1 canteen cap contains a hole that allows an external drinking tube of a chemical protective mask to be connected to the 1-quart or 2-quart canteen. The water canteen cup are for use with the plastic water canteen. The cup is used for drinking hot and cold liquids, soups, and stews in the field. The stand is intended for use with the cup of the water canteen, and compressed ration heating fuel to heat water and individual components of the Meal, Ready-to-eat. The stand is designed to be carried in the water canteen cover, with the canteen cup nested inside the stand, and the canteen nested in the cup. 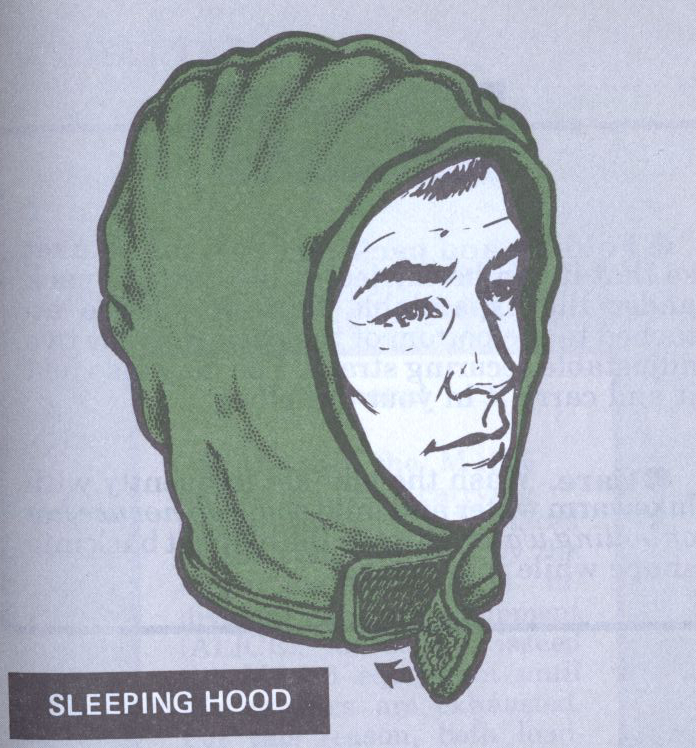 The sleeping hood is intended to be worn on the head to keep the head area of the sleeping bag clean from head oils, perspiration and dirt. The poncho liner is a polyester batting article covered with 3 plys of ripstop nylon, and is intended for use as a sleeping bag when used with a poncho, or as a blanket. The liner has eight tie tapes fot attaching it to the poncho. 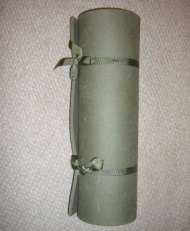 The sleeping mat is intended for use as a ground cover in conjuction with the sleeping bag. 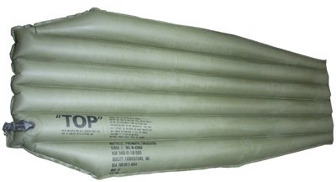 The self-inflating sleeping mat is intended to insulate from the cold and moisture of bare ground when placed under a sleeping bag, and also to cushion its user from obtrusive objects when lying on the ground. 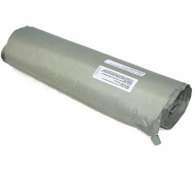 The insulated pneumatic mattress is inflated by mouth and is intended for use in conjunction with arctic and mountain sleeping bags. The extreme cold weather sleeping bag is for use in locations where mean monthly temperatures are below +10°F. The intermediate cold weather sleeping bag is for use in locations where mean monthly temperature ranges from +45°F to +10°F. The Extreme Cold Weather Sleep System (ECWSS) will provide environmental protection between +40°F and -45°F (+5°C and -46°C) and is intended to be used with the foam sleeping mat. The Intermediate Cold Weather Sleeping System is an ICW version of the extreme cold weather sleeping system. The Modular Sleep System is designed to insulate the user in environments ranging from mild weather to extreme cold weather. 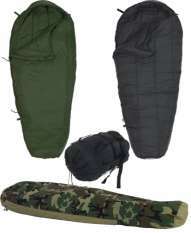 The M-1942 arctic sleeping bag consists of two down and feather filled cases for use in extreme low temperatures. The inner bag is mummy shaped. 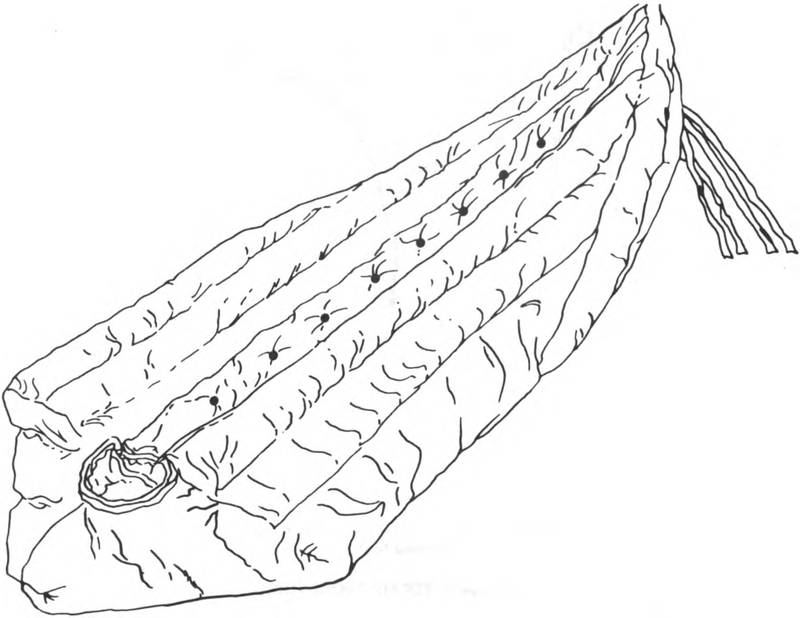 A full length zipper is used to close the quilt shaped outer bag. A waterproof wrap case, having flaps and tie tapes, is provided for carrying both rolled bags. 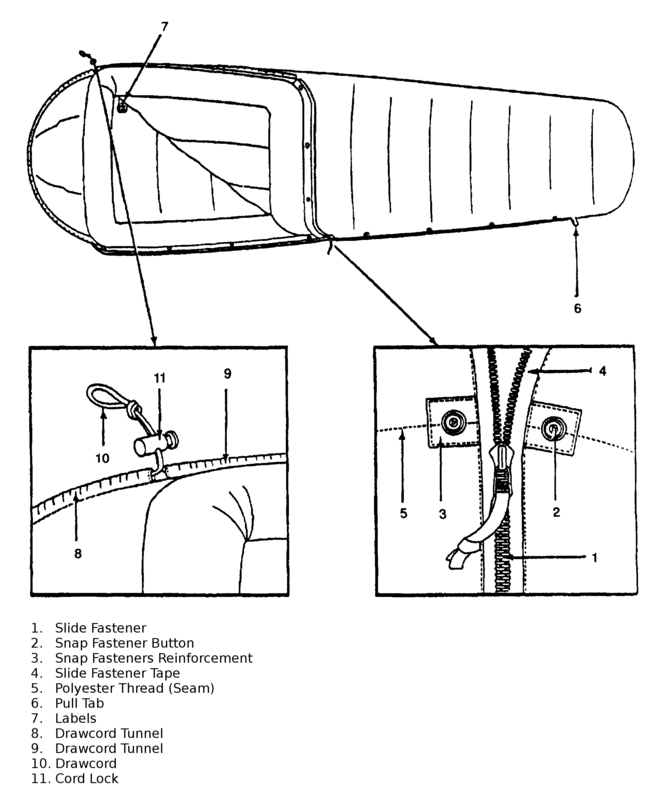 The M-1942 mountain sleeping bag is a mummy shaped, down and feather filled sleeping bag, made in regular and large size, in which an over-lapping tube construction prevents the entry of cold air at the stitching. The shape and design gives maximum warmth with minimum weight. Tie straps are attached to the foot of the bag. A waterproof bag is provided for protecting the rolled bag. The regular bag weighs 5.75 lbs. The large bag weighs 6.00 lbs. The wool sleeping bag was originally made of knitted wool cloth, which was replaced by a woven, 21 1/2-ounce napped wool cloth because of the extreme shrinkage occurred when laundered. 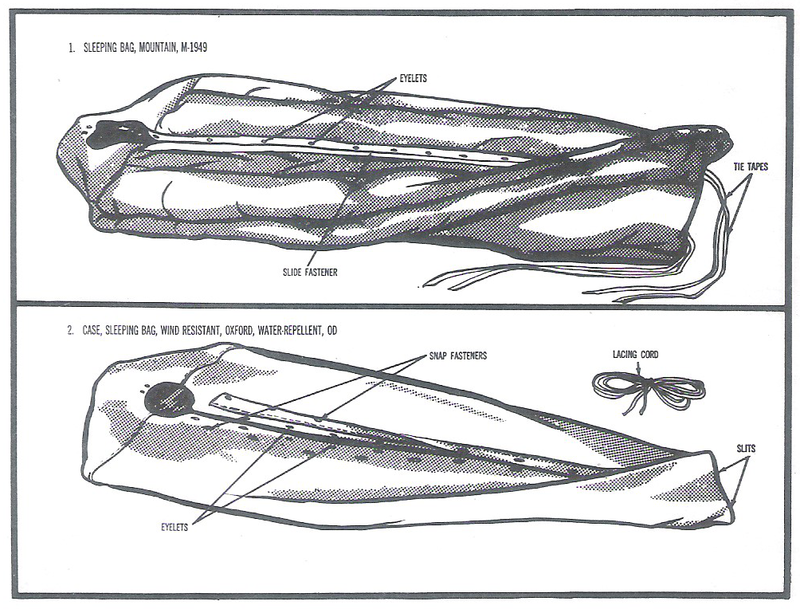 It was mummy-shaped and provided with a 30-inch heavy slide fastener. The water repellent sleeping bag case is made of poplin and provides a wind-resistant cover for the sleeping bag. It is ordinarily used with all sleeping bags. In warm weather, when little protection is needed, the case may be alone. Two openings in the seam at the foot of the case allow the tie straps on the sleeping bag to to be drawn to the outside to hold the items in a compact unit when rolled. It weighs 1.88 lbs. 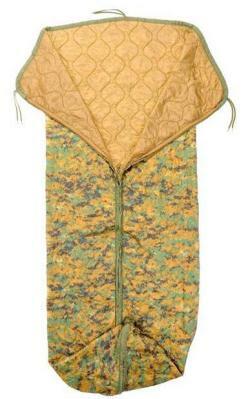 M-1945 arctic sleeping bag consists of two sleeping bags: outer casing and inner casing. Both have full-length opening with zipper and eyelets for lacing the water repellent case. 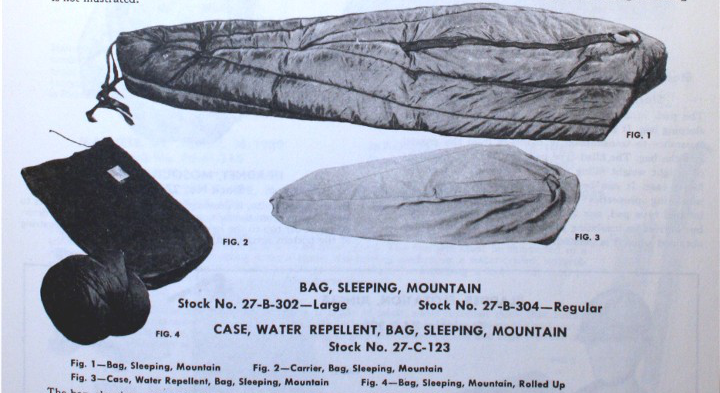 M-1945 mountain sleeping bag is identical with inner component of M-1945 arctic sleeping bag. 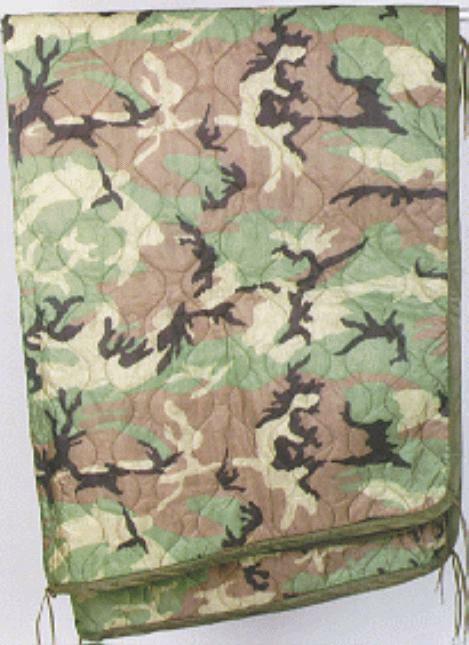 The M-1945 water repellent sleeping bag case provides a wind resistant, water repellent cover for the sleeping bag. 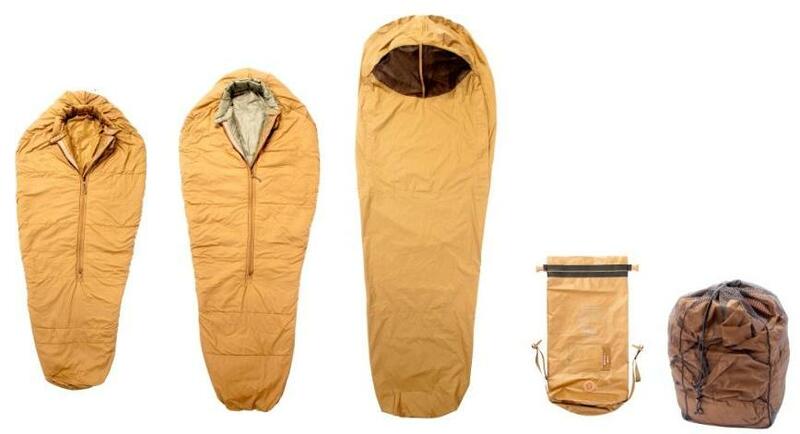 The M-1949 arctic sleeping bag consists of two mummy-shaped sleeping bags: outer bag and inner bag. It is for use in temperatures of 14°F and below. The SRU-21/P survival vest kit is a complete survival package which is worn by personnel on all types of Army aircraft, except OV-1. The Air Force Airsave vest will serve as the mounting platform for the Joint Service Aircrew Mask (JSAM) tactical components using the Modular Load-carrying Equipment (MOLLE) capability of the vests. Airsave also offers a variety of pockets and attachments suited for specific survival gear and in-cockpit components. Placed in the various pockets on the SARVIP vest are the following items: compass, mirror, smoke and Illumination flares, sea dye marker, distress light marker, chemical agent detectors, distress signal kit, operators manual, and survival packets consisting of medical and basic components necessary for survival. The packets for the SARVIP vest is of the following four types: basic, medical, first aid dressing and water storage bag, combat casualty bag. The SARVIP vest consists of a raschel knitted aramid cloth body and aramid oxford cloth pockets. The vest has rescue lift straps and quick release mechanism for emergency recovery operation.